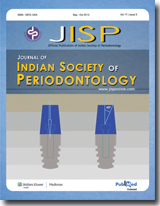 Research in the field of periodontology has witnessed a tremendous upsurge in the last two decades unveiling newer innovations in techniques, methodologies, and material science. The recent focus in periodontal research is an evidence-based approach which offers a bridge from science to clinical practice. This three part review series intends to take a reader through a maze of periodontal research, unraveling and simplifying various issues in the design, conduct and interpretation of various study designs routinely used in the field of periodontal research. This understanding would facilitate a researcher with a focused and an enhanced vision toward formulating studies which can more efficiently translate sound scientific phenomena into clinically meaningful results. 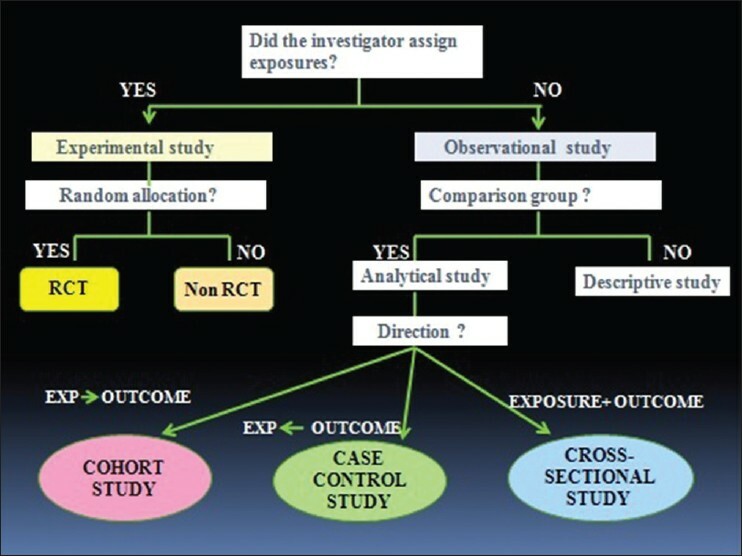 A good research beginning refers to formulating a well-defined research question, developing a hypothesis and choosing an appropriate study design. The first part of the review series has discussed these issues in depth and this paper intends to throw light on other issues pertaining to the implementation of research. These include the various ethical norms and standards in human experimentation, the eligibility criteria for the participants, sampling methods and sample size calculation, various outcome measures that need to be defined and the biases that can be introduced in research. Statistical analysis is the backbone of research and however befuddling it is to a clinician, it is crucial for a researcher to understand the various assumptions underlying the statistical methods. 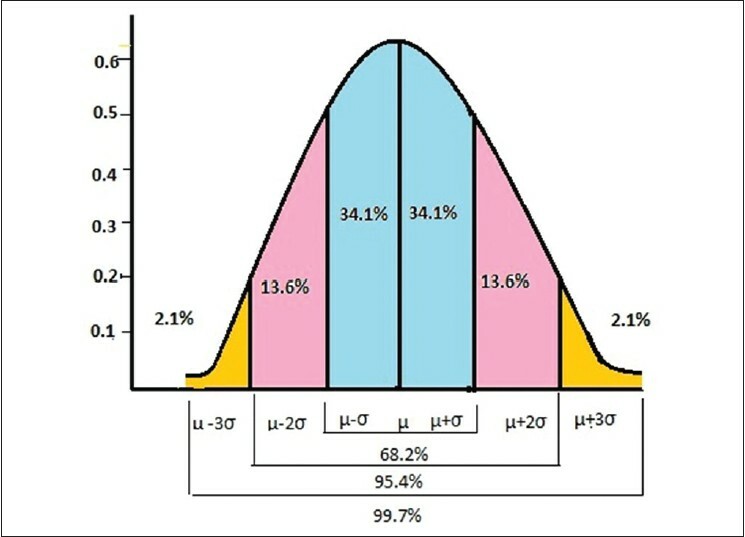 This paper aims at simplifying the various statistical methods that are routinely used in periodontal research. Data presentation, the relevance of clinical as against statistical significance and writing of a report are also discussed. Bone is unique of all the tissues in the vertebrate organism. When injured, it heals by formation of new bone. 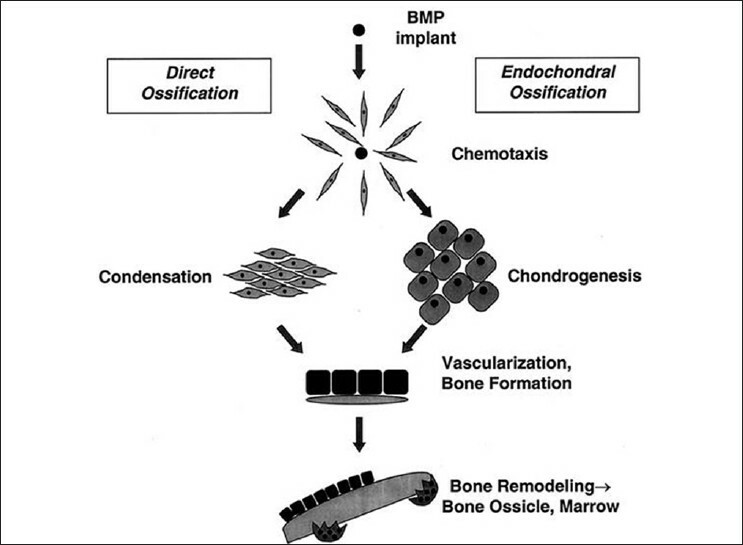 Bone morphogenetic proteins (BMPs) are powerful inductors of the osteogenic activity during the embryologic bone formation phase and in cases of bone healing. They have proliferative effects on different cellular types, showing chemotactic properties and are able to induce mesenchymal cells differentiation into osteoblastic and chondroblastic line cells. Both primary cells and cell lines have been shown to respond to BMPs. Further the ability of embryonic cells to respond to BMPs by differentiating into cartilage and bone cells suggests that they are involved in the development of embryonic skeletal system. In addition, these proteins can also promote the angiogenesis, regulate the activity of some growth factors, and affect the production of these growth factors, which is helpful for the osteogenesis. BMPs have been considered as the most potent growth factors that can promote the bone regeneration. Thus, the aim of this review is to emphasize on the unique nature of the BMP molecules regarding their structure, classification, signaling mechanism, etc., as BMPs are the only molecules which show such deviation from the normal order, type. This will further help in understanding the role of BMPs and their potential advances which are necessary to facilitate the process of regeneration in periodontics. The prevalence of drug addiction is increasing globally. Drug abuse damages many parts of the body such as oral cavity, lungs, liver, brain, heart etc., Addicts suffer from physical, psychological, emotional and behavioral problems. Their nutrition is also compromised. There is certainly an impact of all these factors on the health of periodontium. Dentists should be aware of the effects of drugs while treating the drug addicts. This article correlates the studies done on the impact of abused drugs such as alcohol, tobacco, opiates, cannabis, amphetamines etc., on general and periodontal health. Background: It is suggested that diabetes plays an important role in tooth loss. The periodontal structure and alveolar bone architecture in diabetics have revealed alterations. However, changes in cementum of diabetics with periodontal disease have not been evaluated adequately. Thus, the aim of the study is to evaluate and compare the thickness of cementum in diseased and healthy areas of roots of teeth with chronic periodontitis from non-diabetic (group I) and type 2 diabetic patients (group II). Materials and Methods: Thirty incisors indicated for extraction as a result of chronic periodontitis from group I and group II were selected. Measurements of Probing Depth (PD) and Clinical Attachment Loss (CAL) were taken prior to extractions. Area of the root surface above the CAL (notch) was designated as diseased, while the area below the CAL (notch) was designated as healthy. The extracted tooth samples were sectioned longitudinally and were evaluated by scanning electron microscopy (SEM). Descriptive statistical analysis was performed. Results of continuous measurements were presented as Mean ΁ SD. Results: The results showed that in both groups the thickness of cementum in diseased areas was lower in comparison to the thickness in healthy areas. The mean thickness of cementum in both healthy and diseased areas was higher in group II compared to group I, though the differences in both were not statistically significant. Conclusion: Within the limits of the present study, group II showed greater mean thickness of cementum in both healthy and diseased areas compared to group I, though the differences were not statistically significant. Objective: The aim of the study was to evaluate periodontal health status in patients diagnosed with type 1 diabetes mellitus (DM1) and to establish a correlation between metabolic control and periodontal health status. Materials and Methods: Periodontal health parameters namely plaque index (PI), gingival index (GI), probing pocket depth (PPD) and clinical attachment loss (CAL) were recorded in 28 patients diagnosed with type 1 diabetes mellitus (DM1) and 20 healthy controls. Diabetes history was recorded based on the information provided by the physician and it included date of diagnosis, duration, age of diagnosis, latest values of glycosylated haemoglobin and existing diabetic complications. Statistical analysis was performed to evaluate the relationship between periodontal parameters and degree of metabolic control, the duration of the disease and the appearance of complications. Results: The periodontal health in the diabetic group was compromised and they had greater bleeding index (P < 0.001), probing pocket depth (P < 0.001) and clinical attachment level (P = 0.001). Patients diagnosed for diabetes for shorter duration of time (4-7 years) showed bleeding index-disease severity correlation to be 1.760 ΁ 0.434. Conclusion: Periodontal disease was more evident in type 1 diabetes mellitus patients and periodontal inflammation is greatly increased in subjects with longer disease course, poor metabolic control and diabetic complications. Background: The objectives of this study were to investigate the incidence of cervical enamel projection (CEP) in molars of Indian dry human skulls and to evaluate its relationship with furcation involvement (FI). Materials and Methods: The material consisted of 944 upper and lower first, second and third permanent molars from 89 Indian dry human skulls. CEPs were investigated from the buccal aspect of the tooth and classified according to a system describeddescribed by Masters and Hoskins. FI was measured horizontally from the buccal aspect into the furcation with a graduated probe to the nearest millimeter. Any measurement ≥2 mm was considered to have positive FI. Results: The results showed that CEPs was found more frequently in the mandibular than in the maxillary molars (2:1). The highest incidence of CEP was found in the mandibular second molar (14.7%) followed by the maxillary second molar (14.6%). The mandibular third molar showed the lowest incidence (5.5%). The association between CEP and FI (87.5%) was statistically significant. This favors the view of the possible role played by such anomalies in the progression of periodontal diseases. CEP in male skulls (77.4%) was significantly more prevalent than in female skulls (20.4%). No significant difference was found between the right and left side of maxillary and mandibular teeth with CEP and FI. Conclusion: The findings suggested the role of CEPs as a local contributing factor in localized chronic periodontitis and FI in molars. Detailed examination as well as early diagnosis of periodontal disease at the region of furcation is clinically very important. Background: The aim of the present study was to evaluate and compare the clinical and microbiological effectiveness of Periochip TM as an adjunct to scaling and root planing (SRP) with SRP alone in patients with chronic periodontitis. Materials and Methods: This randomized, split mouth, 3-month clinical and microbiological trial included 30 sites in 15 patients aged 30-50 years diagnosed with chronic periodontitis. In each patient, two bilateral pockets probing 5-7 mm were randomly assigned to test and control groups. 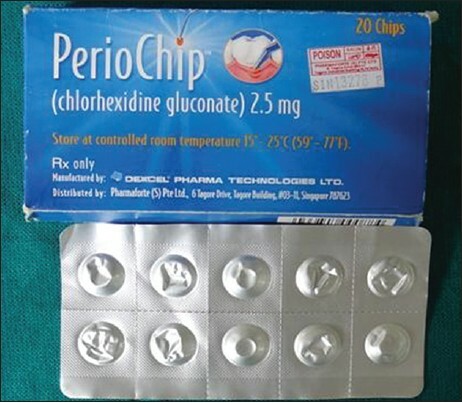 The test group received SRP plus Periochip TM , whereas the control group received SRP alone. Clinical indices and anaerobic culture analysis was done at baseline, 1 month, and 3 months interval. 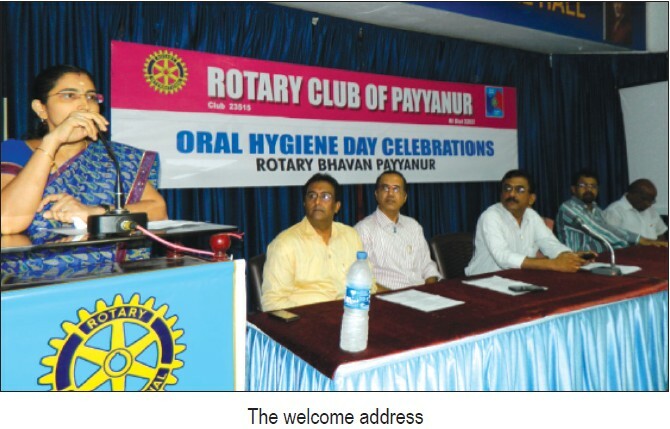 Total bacterial count and analysis of four major periodontopathogenic bacteria Porphyromonas gingivalis (Pg), Prevotella intermedia (Pi), Aggregatibacter actinomycetemcomitans (Aa), and Fusobacterium nucleatum (Fn) was done. Results: Significant improvement was obtained in all clinical variables in the test group as compared to the control group over the study period. Total colony counts were significantly reduced in the test group as compared to control over the period of time. At baseline Aa was recovered from 4 test group sites and 5 control group sites, Pg from 15 test group and 14 control group sites, Pi from 5 test group and 2 control group sites, Fn from 7 test and 7 control group sites. At 3 months, Aa was recovered from 1 test group and 4 control group sites, Pg from 4 test group and 8 control group sites, Pi from 1 test group and 1 control group site, Fn from 3 test and 4 control group sites. Conclusion: Periochip TM placement as an adjunct to SRP, showed promising results, when compared to SRP alone. Healthy microflora can be maintained for a longer period of time and delay in the repopulation by periodontopathic microorganisms was observed. Background: Changes in pulse rate and blood pressure are common consequences during oral surgeries. Hypoxia during surgical process is another side effect. The objective of the present study was evaluation of blood hemoglobin oxygenation and hemodynamic changes during periodontal surgery. Materials and Methods: This clinical trial study was conducted upon 50 subjects aged 30-55 years who referred to the clinic of dental faculty of Babol University and needed periodontal surgery with modified widman flaps in the anterior section of the maxilla. Pulse rate, blood pressure, and pulse oximetric evaluations were recorded in five stages during surgery. Results: The average of systolic and diastolic blood pressure had been in their maximum amount in the second stage of evaluation and minimum amounts were in the first one; while pulse rate changes were greatest in the second stage and lowest in the fifth stage. 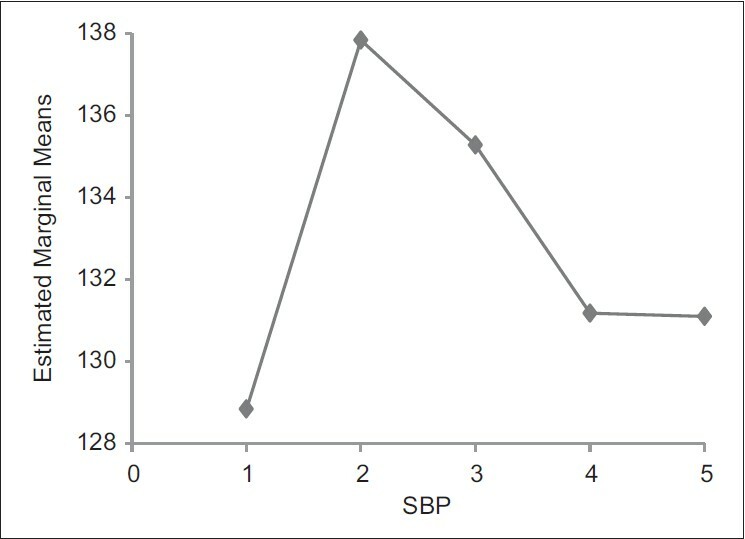 Analyzing the data revealed no significant difference in Blood Oxygen Saturation (SpO2) measurements in none of the stages evaluated. Conclusions: Blood pressure and heart rate increased significantly after the injection of anesthetic drug and in further phases they were decreased after the elimination of stimulating effect of adrenaline. SpO 2 changes were not significantly prominent. Background: The ultimate goal of periodontal therapy is predictable regeneration of a functional attachment apparatus destroyed as a result of periodontitis. Reconstructive procedures have been used with varying success during the past decades to accomplish this goal. Aim: To evaluate whether the use of porous hydroxyapatite alone or a bioresorbable membrane alone would enhance the clinical results in the treatment of class II furcation defects in human lower molars. 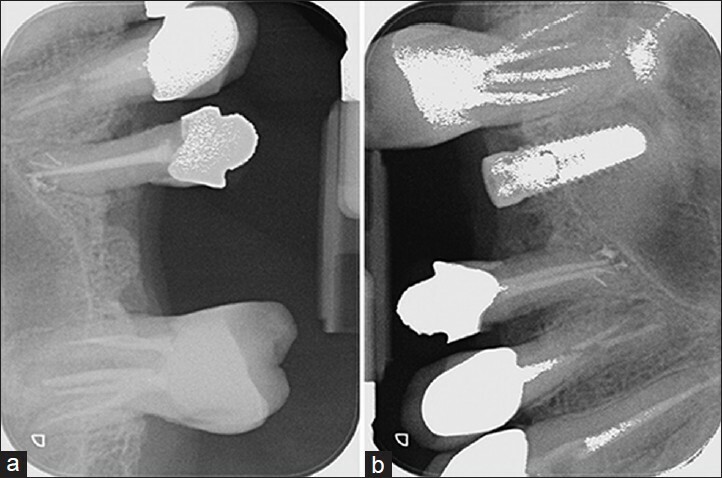 Materials and Methods: Fifteen patients with chronic periodontitis, aged between 39 and 49 years, with a pair of similar bilateral class II furcation defects (classification of Hamp et al.) in mandibular first molars were selected. A split-mouth design was incorporated and the selected 30 furcation defects were assigned to one of the two treatment groups, i.e., Group I treated with a bioresorbable membrane from bovine-derived collagen guided tissue regeneration membrane and Group II treated using porous hydroxyapatite bone graft material on the contralateral sides. Evaluation of clinical parameters, probing depths and attachment levels, and radiographs was done preoperatively and 6 months postoperatively. Results: Both the groups showed statistically significant mean reduction in probing depths and gain in clinical attachment levels and linear bone fill. Comparison between Group I and Group II showed insignificant difference. Conclusion: Within the limits of this study, both the treatment modalities are beneficial for the treatment of human mandibular class II furcation defects. Background: Recently, there has been interest in non-mammalian collagen sources such as fish collagen in periodontal regeneration. In the present study, collagen barrier membrane of fish origin was assessed in the treatment of periodontal intrabony defects. Materials and Methods: Ten systemically healthy chronic periodontitis patients having a paired osseous defect in the mandibular posterior teeth were selected and randomly assigned to receive a collagen membrane (test) or open flap debridement (control) in a split mouth design. 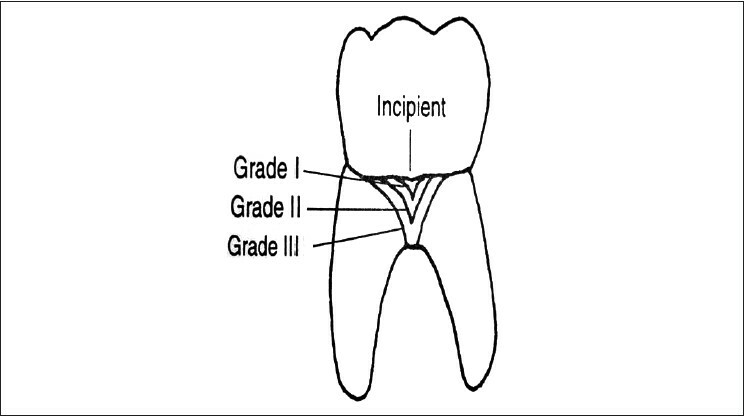 Clinical parameters such as Plaque index, Gingival bleeding index, Probing pocket depth, Relative attachment level, and Recession were recorded at baseline, 3, 6, and at 9 months, while radiographic evaluation was done to assess alveolar crestal bone level and percentage of defect fill at 6 and 9 months using autoCAD 2007 software. Student's t test (two-tailed, dependent) was used to find the significance of study parameters on continuous scale. Significance was set at 5% level of significance. Wilcoxon signed rank test was used to find the significance of percentage change of defect fill. Results: The comparison between the two groups did not show any statistically significant differences in the parameters assessed (P > 0.05) but, within each group, clinical parameters showed statistically significant differences from baseline to 9 months (P < 0.05). Conclusion: Within the limits of the study, it can be inferred that no significant differences were found either by using collagen membrane of fish origin or open flap debridement in the treatment of periodontal intrabony defects. Background: There are various techniques developed to treat the exposed roots, a recent innovation in dentistry is the use of second generation platelet concentrate which is an autologous platelet-rich fibrin gel (PRF) with growth factors and cicatricial properties for root coverage procedures. Therefore, the present research was undertaken to study the additional benefits of PRF when used along with coronally advanced flap (CAF). Materials and Methods: Total of 15 systemically healthy subjects presenting bilateral isolated Miller's class I and II recession were enrolled into the study. Each patient was randomly treated with a combination of CAF along with a platelet-rich fibrin (PRF) membrane on the test site and CAF alone on the control site. 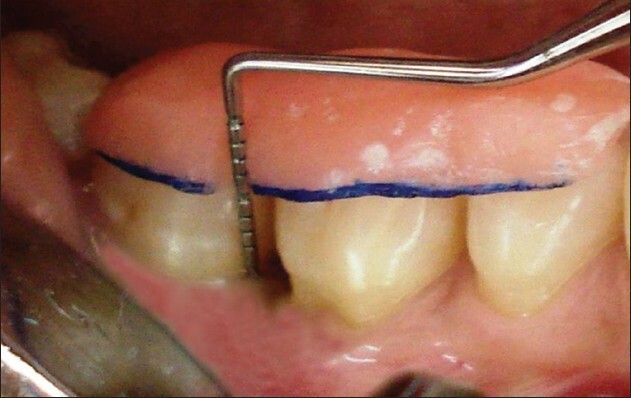 Recession depth, clinical attachment level (CAL), and width of keratinized gingiva (WKG) were compared with baseline at 1, 3, and 6 months between test and control sites. Results: Mean percentage root coverage in the test group after 1, 3, and 6 months was 34.58, 70.73, and 100, respectively. Differences between the control and test groups were statistically significant. This study also showed a statistically significant increase in WKG in the test group (2.94 ± 0.77 at baseline to 5.38 ± 1.67 at 6 months). Conclusion: CAF is a predictable treatment for isolated Miller's class I and II recession defects. The addition of PRF membrane with CAF provides superior root coverage with additional benefits of gain in CAL and WKG at 6 months postoperatively. Aim: The aim of the study is to evaluate the influence implant length on stress distribution at bone implant interface in single immediately loaded implants when placed in D4 bone quality. 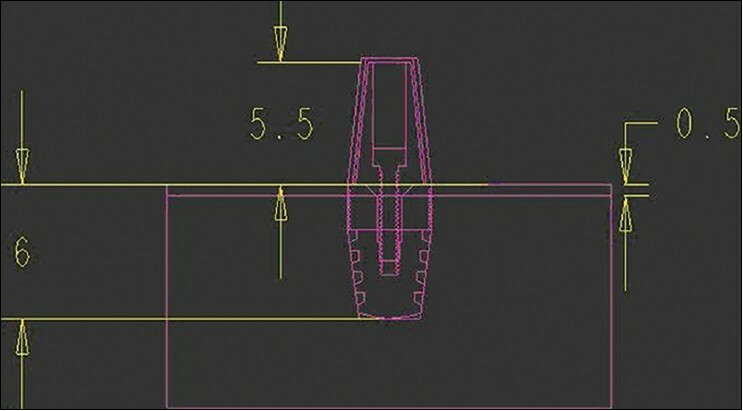 Materials and Methods: A 2-dimensional finite element models were developed to simulate two types of implant designs, standard 3.75 mm-diameter tapered body implants of 6 and 10 mm lengths. The implants were placed in D4 bone quality with a cortical bone thickness of 0.5 mm. The implant design incorporated microthreads at the crestal part and the rest of the implant body incorporated Acme threads. The Acme thread form has a 29° thread angle with a thread height half of the pitch; the apex and valley are flat. A 100 N of force was applied vertically and in the oblique direction (at an angle of 45°) to the long axis of the implants. The respective material properties were assigned. Micro-movements and stresses at the bone implant interface were evaluated. Results: The results of total deformation (micro-movement) and Von mises stress were found to be lower for tapered long implant (10 mm) than short implant (6 mm) while using both vertical as well as oblique loading. Conclusion: Short implants can be successfully placed in poor bone quality under immediate loading protocol. The novel approach of the combination of microthreads at the crestal portion and acme threads for body portion of implant fixture gave promising results. Background: Although autografts are the standard procedure for bone grafting, the use of bone regeneration by means of dental pulp stem cell is an alternative that opens a new era in this field. Rigenera Protocol is a new technique able to provide the surgeon autologous pulp micro-grafts. Materials and Methods: At the Department of Oral Surgery, Don Orione Hospital, Bergamo, Italy, one patient underwent sinus lift elevation with pulp stem micro-grafts gentle poured onto collagen sponge. A CT scan control was performed after 4 months and DICOM data were processed with medical imaging software which gives the possibility to use a virtual probe to extract the bone density. Pearson's Chi-square test was used to investigate difference in bone density (BD) between native and newly formed bone. Results: BD in newly formed bone is about the double of native bone. Conclusion: This report demonstrated that micro-grafts derived from dental pulp poured onto collagen sponge are a useful method for bone regeneration in atrophic maxilla. A peripheral cement-ossifying fibroma is a benign fibro-osseous lesion of a reactive rather than a neoplastic nature, whose pathogenesis is uncertain. It predominantly affects adolescents and young adults, with the peak prevalence between 10 and 19 years, especially affecting females (two to four times more). Such lesions are commonly found on the maxillary bone. 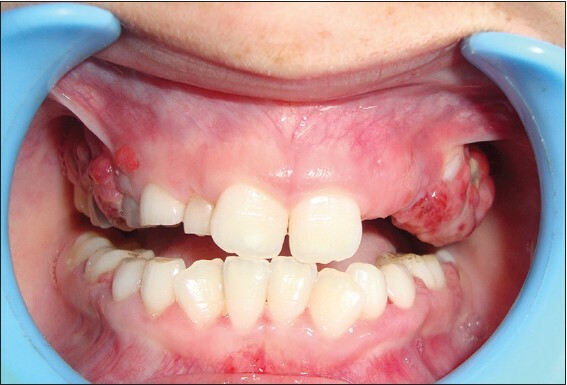 We hereby present and discuss a unique case of multicentric Peripheral Ossifying Fibroma (POF) affecting both the maxillary and the mandibular gingiva in an 11-year-old boy, with a disease duration of two months. This case is probably one of the first few cases discovered, which demonstrates that there may be a multicentric variant of the Peripheral Ossifying Fibroma. The purpose of this article is to present a case of POF and to briefly review the current literature on this condition. Odontogenic myxoma comprises 3-6% of all odontogenic tumors. Odontogenic myxomas are relatively rare benign mesenchymal tumors found exclusively in the tooth-bearing areas of the jaw and are usually located centrally in the mandible. Soft-tissue localization is rarely seen and is classified as peripheral myxoma. Peripheral myxoma is slow growing and less aggressive, as compared to the central myxoma. It has a low recurrence rate. Till date, only few cases of maxillary gingival myxomas are reported in the literature. Here, we present an unusual case of primary peripheral odontogenic myxoma occurring in the gingiva of anterior maxilla in a 41-year-old female patient. Gingival melanoacanthoma is a rare, benign pigmented lesion characterized clinically by sudden onset and rapid growth of a macular brown black lesion and histologically by acanthosis of superficial epithelium and proliferation of dendritic melanocytes. 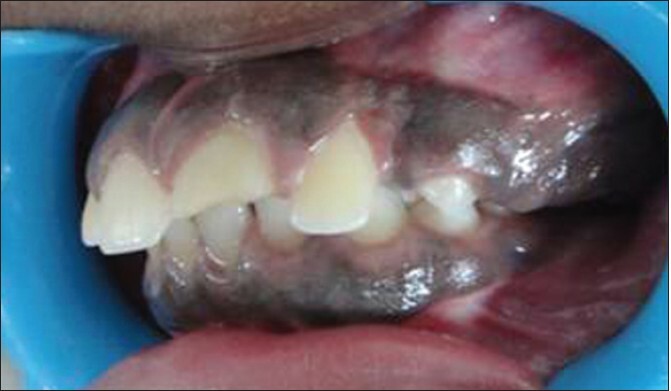 This article reports a previously undescribed case of pigmented unilateral diffuse gingival enlargement, which on histopathological examination proved to be melanoacanthoma. Intraoral examination revealed pigmented unilateral diffuse gingival enlargement in relation to second and third quadrants buccally, palatally/lingually. Based on these clinical findings, gingivectomy was performed and the excised tissue was sent for biopsy. Microscopic examination revealed acanthotic and parakeratotic surface epithelium with dendritic melanocytes distributed in basal and suprabasal layers of the epithelium. 1 year follow-up recall revealed no recurrence of lesion at the surgical sites. 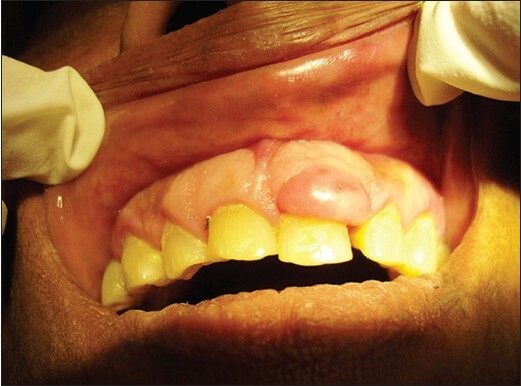 Our patient exhibits an unusual clinical presentation of melanoacanthoma of gingiva. 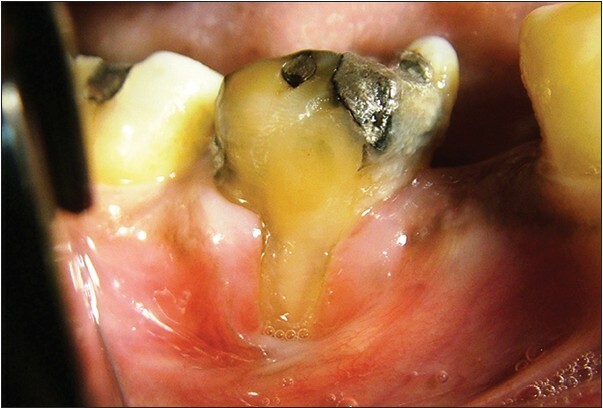 Pigmented gingival overgrowth of recent origin and without any etiologic factors warrants histopathologic examination. Loss of periodontal attachment and subsequent recession is one of the most common deformities that affects the periodontium. Gingival recession is a muco-gingival defect, which is commonly treated for esthetic and physiologic reasons. Adequate thickness of attached gingiva and root coverage is essential in restored teeth for proper masticatory function as well as for oral hygiene maintenance. Various root coverage procedures Nill have been proposed to correct recession defects, including coronally advanced flap and lateral pedicle flap (LPF). 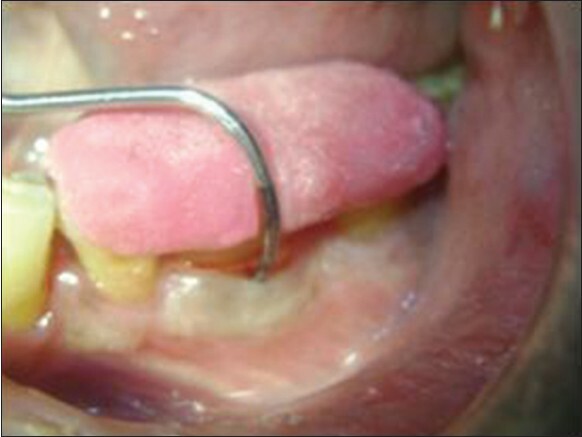 A case report is presented dealing with the treatment of a gingival recession on a mandibular molar tooth using LPF with a 6-year follow-up. Aesthetic considerations have influenced the management of dental maladies in varying degrees for many years. Even single tooth mal-alignment makes the patient to approach a dentist. Intentional replantation is a procedure in which an intentional tooth extraction is performed followed by reinsertion of the extracted tooth. Many authors agree that it should be reserved as the last resort to save a tooth after other procedures have failed or would likely to fail. The main reason of failure in replanted teeth is root resorption, specifically ankylosis or replacement resorption. Although the success rate is not always high, intentional replantation may be a treatment alternative that deserves consideration to maintain the natural dentition and avoid extraction of the tooth. 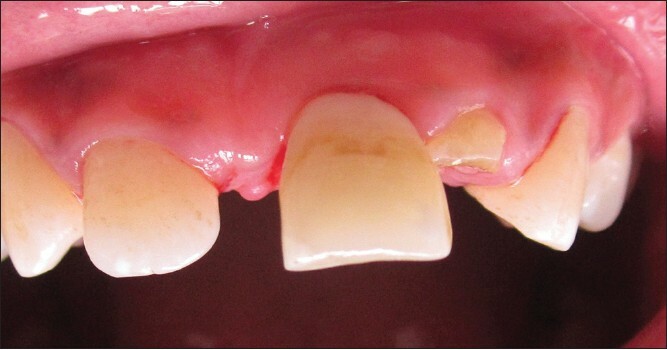 Here is case report of a patient desiring alignment of malpositioned periodontally involved anterior single tooth due to various causes treated by intentional replantation. Traumatic injuries are the most studied yet most challenging for a dentist. Extrusive luxation injuries are usually managed by repositioning tooth in the original position and pulp sensibility is evaluated at regular periodic intervals. However, when injuries are chronic, tooth is necrotic with compromised periodontal support, treatment is a challenge. Intentional replantation utilizing growth factors in fibrin rich network of platelet rich fibrin can be a treatment modality in such patients where other restorative modalities to establish function-esthetics rehabilitation is not possible. Dental therapy in general and periodontal therapy in particular is directed increasingly at the esthetic outcome for patients. Gingival recession is one of the most common esthetic concerns associated with periodontal tissues. 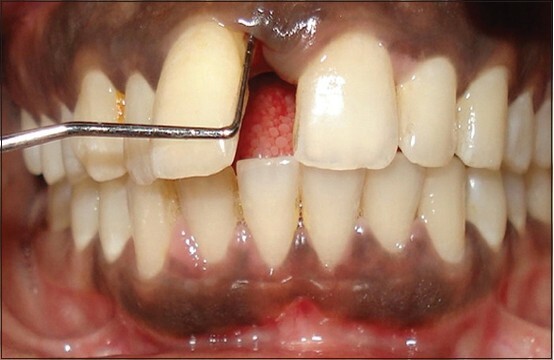 Although various treatment modalities have been developed, subepithelial connective tissue grafting remains the most successful and predictable technique for treatment of gingival recession. Harvesting a connective tissue graft from the palate is many times not only traumatic, but also very painful for the patient. Use of single incision to harvest the subepithelial connective tissue graft is one of the least traumatic, but relatively difficult technique to accomplish. This article presents a modified single incision technique, which is not only less traumatic and painful, but comparatively simple to employ and master. Two new instruments have been introduced to make harvesting of the connective tissue graft easier. The goal of modern implant therapy entails more than just the successful osseointegration of the implant. A successful result must also include an esthetic and functional restoration surrounded by stable peri-implant tissue levels that are in harmony with the existing dentition. 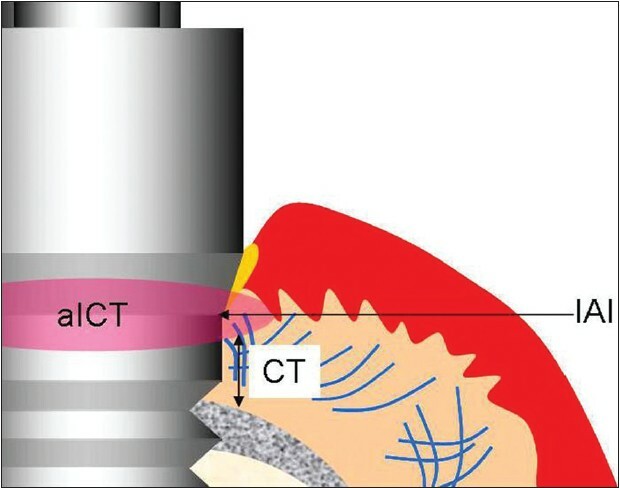 In an attempt to improve long-term bone maintenance around implants, a new implant-to abutment connection referred to as "platform switching" has been proposed. It refers to the use of an abutment of smaller diameter connected to an implant neck of larger diameter. Platform switching is a simple and effective way to control circumferential bone loss around dental implants. This short communication aims to present an overview of concept of platform switching in dental implantology.